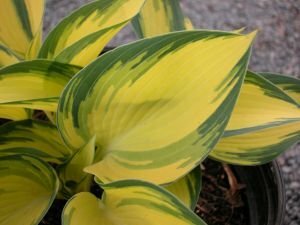 Hostas are a versatile plant that has a place in any landscape. They come in many different sizes, colors and textures. They are hardy and forgiving plants that are easy to maintain and propagate. Propagation is usually done by dividing them in the spring or fall. They can also be propagated by seed, but the resulting seedlings may not have the same characteristics as the original plant. While considered a shade plant, some varieties will do well in partial to full sun. Their colors can be light to dark green with shades of blue and chartreuse. They are often variegated with white or yellow. Their leaves can range from an inch or two across to several inches and can be smooth or deeply textured.